Snowy Nor'easter Brings Threat of More Power Problems - Integration Through Media ....! 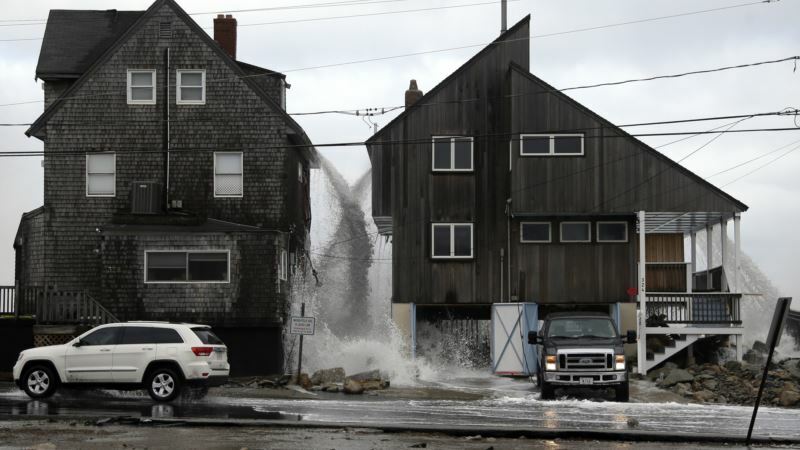 (VOA): Another snowy, blowy nor'easter threatened a new round of power outages as it began moving up the East Coast Wednesday, causing officials to close schools and government offices and raising concerns for utility customers still trying to bounce back from an earlier storm. A wintry mix of snow and light rain started falling early Wednesday in many areas, but the precipitation was expected to soon turn to all snow in most areas and then continue through the day. The National Weather Service issued a winter storm warning that stretched from eastern Pennsylvania to most of New England, which was due to be in effect through Thursday morning. Snow accumulations could easily surpass a foot in areas west of the I-95 corridor, with some places in northwest New Jersey forecast to get up to two feet. "I'm not looking forward to another round of this, but it is what it is,'' Chris Martin said as he prepared to leave his Toms River, New Jersey home and head to work at an information technology firm in Philadelphia. "All in all, it hasn't been a terrible winter, and it seems that March is always our worst month for major storms. We're a hearty bunch, so some snow and rain isn't going to stop us.'' Martin had already arranged to stay in Philadelphia overnight, preferring not to take a chance with the expected treacherous road conditions. "I keep telling myself spring is tight around the corner,'' Martin said with a laugh. "If Mother Nature wants to give us one last blast of winter, that's up to her.'' Heavy, wet snow and gusting winds could take down trees already weakened from last week's storm and snap power lines, adding to stress for customers who've gone days without power. Utility workers took advantage of milder temperatures and sunshine Tuesday in their scramble to restore electricity to thousands of customers around the Northeast. More than 90,000 homes and businesses remained without power Wednesday, mostly in Pennsylvania, New Jersey and New York. The outages turned to outrage for a New Jersey man whose home had been without electricity since Friday. Robert Winter, 63, threatened to kidnap a utility company employee and blow up a substation, according to police in Vernon. He was charged with making terroristic threats. More than a foot of snow is expected for some interior areas, the weather service said. Pennsylvania's Poconos Mountains and parts of western Massachusetts could see up to 18 inches. Damaging winds are forecast with gusts of up to 60 mph on Cape Cod, 45 mph at the Jersey shore and 30 mph around suburban Philadelphia. Depending on the storm's track, communities along the Interstate 95 corridor could see heavy rain, heavy snow or a mix of both. Transportation departments in Philadelphia and Boston loaded up salt trucks and treated roads Tuesday, and some airlines waived ticket change fees for airports in the storm's projected path, such as Newark, Philadelphia, Boston and New York's JFK. Amtrak canceled some train service Wednesday, and regional rail trains in Philadelphia will be operating on a weekend schedule. School districts and municipal operations around Pennsylvania and Connecticut are closed for the day. New Jersey Gov. Phil Murphy and Pennsylvania Gov. Tom Wolf declared states of emergency. The National Weather Service urged people to stay off the roads to allow emergency and road crews to do their jobs. Some areas will get as much as 2 to 3 inches of snow an hour. Officials advised homeowners to be careful while shoveling, saying the weight of it has been known cause heart attacks. A slight consolation is that the storm is not expected to bring the coastal flooding like the one last week. Some New England and New Jersey communities are still feeling the effects of that storm.